Looks can be deceiving. Even the earth's cutest creatures have a dark side. Our pet cat, Fluffy, is a perfect example of this. Fluffy is adorable and (mostly) sweet but even Fluffy turns on us from time to time. One minute she's enjoying her belly rub and the next she's turning our hand into a personal scratching post. Regardless of Fluffy's erratic behavior, we love him. The same can be said about Feisty Pets— they're a little sweet and a little scary which makes for one endearing pet. The Feisty Pets Sir Growls-A-Lot moveable mask allows kids to embody both personalities. Be both a lovable bear and turn into a snarling Grizzly at the drop of a hat just like the stuffed animal this mask is modeled after. It's great for wearing when putting Fluffy because if Fluffy hisses, we growl back! 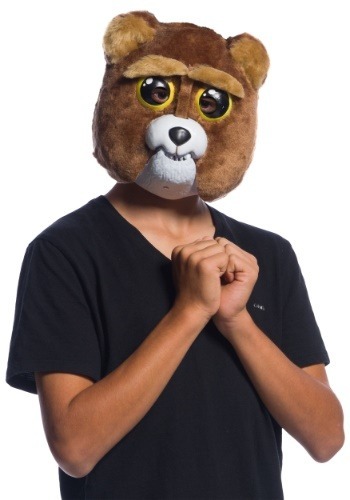 The officially licensed Sir Growls-A-Lot mask is made to look exactly like the popular stuffed animal by the same name with a brown furry face and big yellow eyes. Open your mouth while wearing the mask and it completely changes. Once your mouth is opening, Sir Growls-A-Lot furiously furrows his brow and reveals his sharp teeth. Pair this mask with any bear costume for a head-to-toe look!